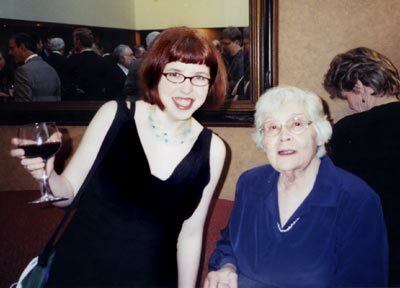 Me with the legendary Etta Hulme. That's her brandy, not mine. Every year the Association of American Editorial Cartoonists holds an exciting, informative and alchohol-drenched convention at a different cartoonist's home base. Last year it was Rob Rogers's Pittsburgh, Pennsylvania party, and this year the festivities were at Joel Pett's Lexington, Kentucky headquarters. So not only did I get to hang out with Cindy Procious, Clay Bennett, Steve Sack, Signe Wilkinson, Etta Hulme, Kirk Anderson, Matt Wuerker, Dennis Draughon, J.P. Trostle, Ann Telnaes, Elena Steier (who has a great visual travelogue of the convention), and Mark Fiore, among many others... I got to bet on horses--and lose--with them. Cindy Procious and Clay Bennett are two of my favorite people ever. I first met them back when I was a college cartoonist for the Harvard Crimson, when Clay was on a Kennedy School panel on cartooning. They have also invited me out to play pool (which is very nice of them, since I can't play to save my life) among other things, and they are just way too much fun. I spent Saturday at the Kentucky Horse Park with Cindy, Elena, and Elena's husband Rod, but sadly didn't get to ride any horses. I did learn all about different horse breeds and met some horse-racing champions, like 29-year-old John Henry. Steve Sack, Signe Wilkinson and Rob Rogers aren't just brilliant cartoonists, they also give really good constructive criticism (i.e. they gave me nice portfolio reviews). Young cartoonists say they must wait years for their shot at a dwindling number of daily newspaper posts. Older cartoonists, who typically hang on to their posts for decades, lament that the Golden Age of newspapers is long gone. Portfolios close at hand, Eric Shansby, 18, and Mikhaela Reid, 23, studied the crowds for a view of their industry's venerable lions -- grizzled veterans such as syndicated freelancer Pat Oliphant, Mike Luckovich of the Atlanta Journal-Constitution and Walt Handelsman of Newsday in Long Island, N.Y.
Said Shansby, of Silver Spring, Md., who contributes to weekly newspapers in that area: "All of the cartoonists are baby boomers. Since they stay in their jobs until they die ..."
"They really do," interrupted Reid of Lowell, Mass., who draws for the Boston Phoenix, an alternative news weekly. "They're like federal judges." "We either wait 20 to 30 years for them to die, or we -- I don't know -- we can assassinate 'em," Shansby concluded. For the record, I in no way want anything bad to happen to any staff cartoonists at daily papers. I want them to live long happy productive cartooning lives. And I have a full-time daily newspaper job of my own, thank you, so cartooning for weeklies is just fine with me. Funny people think I'm funny. The final night of the convention, at a fancy banquet, we were treated to some stand-up comedy courtesy of Elayne Boosler. To my surprise, half-way through her act, Elayne gave me a shout-out. I don't recall exactly, but she was telling a joke about women's issues and then mentioned she had seen a cartoon in the AAEC show by a woman cartoonist, Mikhaela. "Is Mikhaela in the house? Stand up!" I did, somewhat flustered, and surprised she had actually pronounced my name correctly... She then proceeded to tell some jokes from my "Gay Marriage Drove Us to Divorce!" cartoon. J.P. took a picture of me shaking hands with her, but my digital camera died on me so you'll just have to imagine it.